Iggy PopÂ loves controversial French writerMichel Houellebecq. I mean, who doesn’t? Right? Transgressive, satirical novels that may or may not be totally racist depending on who you ask? That’s just about everybody’s favorite thing, right? Allow him to explain: “At one point, I just got sick of listening to idiot thugs with guitars banging out crappy music, and I was starting to listen to a lot of New Orleans-era Louis Armstrong, Jelly Roll Morton type of jazz. And I’ve always loved quieter ballads as well.” He also enthuses at length about the bookÂ cÂ and shows his tiny white dog off to the camera. The video ends with a song called “King of the Dogs”, which really is Iggy Pop singing about his “smelly rear” over a New Orleans jazz funeral march. Judging by that, this could easily be the best jazz album that a punk legend has ever made about a French novel. The Stooges’ MySpace page claims the album will be out in May. In that video, Iggy himself says late April, though the video also mentions a May 18 release date. The album also hasÂ a website. Right now, though, it just asks for your email address if you want newsletter updates about the album. Which, clearly, you do. 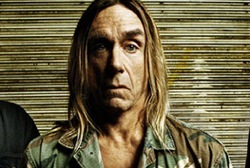 In other overseas Iggy Pop news, the Igster is currently mired in a minor controversy in Britain over his appearance inÂ advertisementsÂ for the insurance company Swiftcover.comÂ AsÂ BillboardÂ reports, British musicians have been complaining about the fact that Swiftcover.com doesn’t actually insure musicians. They’re too risky. Wow, some people are really dumb, huh? infatti se ne inventa sempre una nuova…….